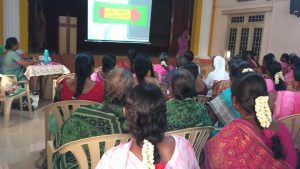 Annual Meet of the Holy Cross Lay Associates was held on 17th Sep. 2017, at Holy Cross College, Fort, Trichy. 102 lay associates attended the meeting. The day was inaugurated with the Holy Eucharist Celebrated by Rev.Fr.Micheal John SJ. 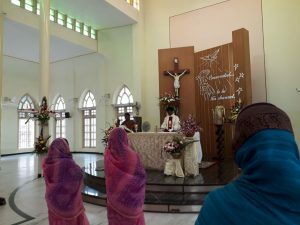 with the significant liturgy prepared by the members of three units – Cantonment, Plani and Namakkal. 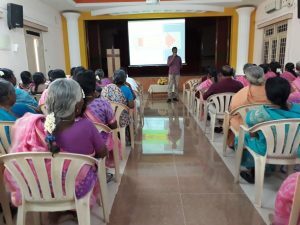 The elected office bearers were presented and their duties were delivered to the group in the presence of Sr.Savari Savarimuthu, the provincial councillor in charge of the commission for lay associates. The theme of the day was “குடும்ப வாழ்வில் மகிழ்வும், மனநிறைவும்”. Rev.Fr.Micheal John SJ. animated the group on the theme of the day and cocluded with the adoration of the Blessed Sacrament. The session came to an end with the fellowship meal.